Editor’s note: Nearly two years after initially being announced, the EPOCH holsters are now available for sale. Some things have changed on them, so scroll down to the updated section for the latest information. 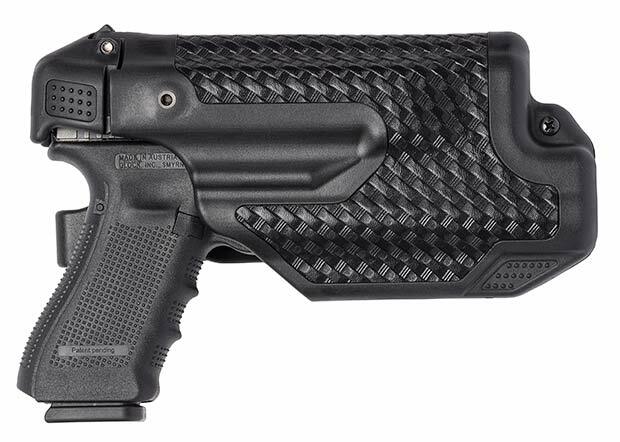 Blackhawk announced production plans for a new duty holster called the Epoch. The Epoch is a level 3 uniform holster that is designed for duty guns with mounted white lights. Unlike the prior Blackhawk duty holsters, the Epoch works with Surefire and Streamlight weapon lights. 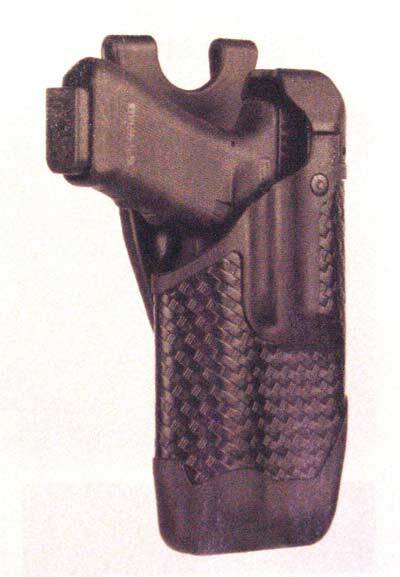 Prior Blackhawk light-bearing gun holsters only worked with the company’s Night-Ops Xiphos light. The Epoch works with the Streamlight TLR-1 and TLR-2 plus the Surefire X300 and X400 lights. A nice bonus to this holster is you can mount any of the above lights and use the same holster. So, if your department had a mix of Surefire and Streamlight, or if your agency transitioned from one to another, you do not need to buy new holsters. The one holster handles all of the lights. Unlike the SERPA duty holster, the Epoch uses a thumb release, not a trigger finger activated release. Blackhawk has received a great deal of criticism, much of which I believe to be unfair, regarding the placement and use of the SERPA’s release lever. The Epoch does not have the same retention system, so it should avoid any of the SERPA safety debate. Initially, the Epoch will be available for just a few handguns, with more models being introduced as time goes on. Expect to see the Smith & Wesson M&P and Glock models (including the larger framed 20/21/37 models) first. Additional models will likely be determined based on demand. I would expect something with SIG SAUER on the slide to be one of the next things to roll off of the drawing board and into production. The Epoch is not part of the SERPA line. The SERPA holsters, which Blackhawk reps tell me are extremely good sellers, will continue to be made and sold. The Epoch line will be an additional product line offering buyers an option in what kind of holster to purchase. 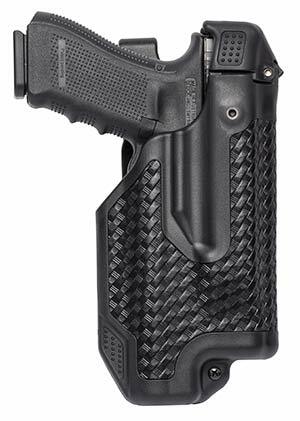 MSRP on the Epoch holsters is $107.99 for the matte black finish and $124.99 for the basketweave and plain finish models. A note about the images: the Epoch is finished and ready for production. However, the team is doing a revision of the cosmetics. Feedback from officers who have been testing the guns have been very positive, but many requested a more attractive holster. As such, the team that handles the exterior appearance is re-working the look of the holster. When the holster goes into production, it will sport the new look. 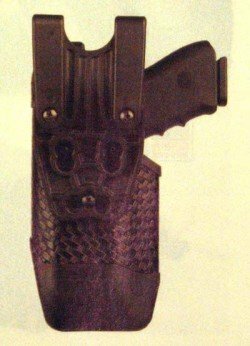 It has been almost two full years since I wrote the original article about the EPOCH holsters. Since that time, the holsters have been through a rigorous R&D program and have been upgraded in a variety of ways. Now, the holsters are ready for duty and are available for purchase. The holsters are still rated as level 3 retention holsters, and are specifically designed to work with pistols that have a mounted light. Holsters are available now for the Glock and Smith & Wesson M&P line of handguns. They are compatible with the Streamlight TLR-1 and TLR-2 model lights (those are the larger lights) and the SureFire X300 and X300 Ultra model lights. I’ve previously carried a TLR-1 on duty, and have reviewed the TLR-2 G weapon light. Both were excellent performers. Currently, there is no word on when .45 ACP versions will be available. Additionally, I have not yet confirmed if the Smith & Wesson holsters are compatible with pistols using the optional thumb safety. MSRP is $107.99 for a matte black finish. Basketweave and plain black finishes (presumably more glossy than the matte) will retail for $124.99. Note that these holsters do not use the SERPA release used in the company’s other line of duty holsters. Does the nebo tactical lights fit in the holdter? Jimmy it looks like the Nebo Model #5569 should fit. That model is very similar in size/shape to Streamlight and other straight under pistol lights. However, to be sure I would check with Nebo or Blackhawk to be sure. The whole idea of the Epoch is to fit more lights than just the Blackhawk Xyphos light, so I’m leaning very heavily towards a yes. I have a streamlighy tlr 1 and it fits just fine. I’m not sure about the one you’re asking about, however, I purchased the holster because it stated in the product description that it would accommodate a variety of different tac lights and wouldn’t be limited to just blackhawk’s tac light like their serpa series holsters. Hope this helps. What is the color difference in the matte and plain black finish..? Is one dArker or lighter? I’m not 100% sure, but it appears that the Matte selection is lighter than plain black, with almost a charcoal gray appearance when the light hits it. I would double check with a Blackhawk distributor to be sure though.